When the United States and the Soviet Union agreed upon the 38th parallel as the point to divide their zones of occupation of Korea following World War II, few thought that this would mark a division of Korea that would last more than half a century. However, due to changes in the world and in the DMZ itself, the very character and meaning of this strip of land that crosses the Korean peninsula has changed. The information revolution has transformed the character and meaning of Korea's DMZ. Formerly it was simply a military demarcation line and a visible, tragic reminder of the long Cold War and the lack of a formal end to the Korean war. Today it is the world's deepest and most prominent digital divide, separating the world's most advanced and extensive digital networks in South Korea, from North Korea which ranks last or near last in the world by most measures of digital networking. Chapter 8 of my recent book, Telecommunications and Transformation in Korea: A Personal Perspective, explores the implications of this change on the Korean peninsula for the manner in which we think about national division as well as the manner in which reunification is likely to occur. The change is also powerfully symbolized by satellite photographs of the Korean peninsula at night, published in earlier posts on this blog. Other dimensions of the Korean DMZ have been recognized by the DMZ Forum for Peace and Nature Conservation, which has published some wonderful resources on its web site. In addition to the photograph published with this post, visitors to the site can tour the DMZ using Google earth. The photograph here immediately struck me, probably because I spent my first two years in Korea in Chuncheon, teaching English at Kangwon National University. 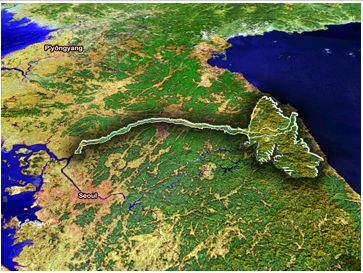 I like the fact that the DMZ Forum hopes to enlarge the peace park project to encompass both Diamond Mountain and Sorak Mountain in eastern Gangweon Province, which is more mountainous and less populated than western stretches of the DMZ. Of course, the success of such a park will also signify reunification of the only Korean province split right in two by the demilitarized zone.